Bodog is a popular casino, sportsbook and poker room that offers players the complete casino experience. They offer every casino game you could imagine with the option to play in a practice mode or play for real money. The table games at Bodog Casino are Blackjack, Baccarat, Caribbean Stud, Craps, Let it Ride, Pai Gow Poker, Roulette and Tri-Card Poker. Each of these games offers rules in the left hand corner and a game objective directly under the game. Bodog also offers a handful of slot machine games and video poker. If you are unsure how to play a game at Bodog Casino.com they offer a casino school section on the site which help novices learn the basic strategy and in-depth rules and instructions on the game. The Bodog Blackjack software is very good and you will not need to download any software to your computer. They have a flash version that allows you to play it directly on the Bodog website. At Bodog Casino you can only play one hand of blackjack at a time. You can bet up to $500 and the minimum at the table is $1 dollar. 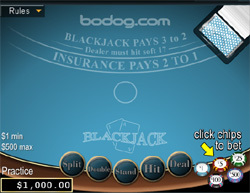 A unique feature of Bodog Casino is they have all of their casino games in flash. This allows players that own any computer OS (Mac, Linux, PC) to play. There are not many options for mac users when it comes to playing blackjack for real money but Bodog offers a great option. Setting up an account and playing at a bodog casino.com will only take minutes and before you know it you will be ready to go because there is no download necessary. All you need to start playing is to make a free account and deposit. Play Bodog Blackjack and other casino games at Bodog Today!